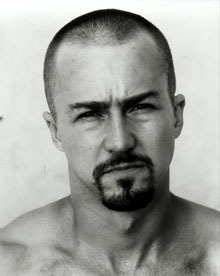 Edward Norton has played a maniacal Southern hick in Primal Fear with Richard Gere, the pornographer's lawyer in The People vs. Larry Flynt, a neo-nazi in American History X, and a gadded roustabout Fight Club. He has also played Nelson Rockefeller in Frida, and the titular purple rhino in Death to Smoochy. Norton's grandfather, James Rouse, was a famous architect and urban designer, often credited with inventing the first shopping malls. He designed the development in Columbia, Maryland, where Norton was brought up. Norton is so clean-cut he refuses to even pretend to smoke for the camera. He dated Courtney Love while they were filming Flynt, and she later credited him with saving her life, after he talked her into entering rehab. Politically, Norton is a Democrat, supporting prominent candidates with substantial donations. He is on the board of the Enterprise Foundation, a charity founded by Norton's grandparents, that helps low-income families find affordable housing. He is also involved with numerous environmental groups. Per Keeping the Faith (DVD commentary).